"Refugees and the US healthcare system"
We all hear the news about refugees who are making a new home and life for themselves in the United States. But what is their experience actually like once they get here? 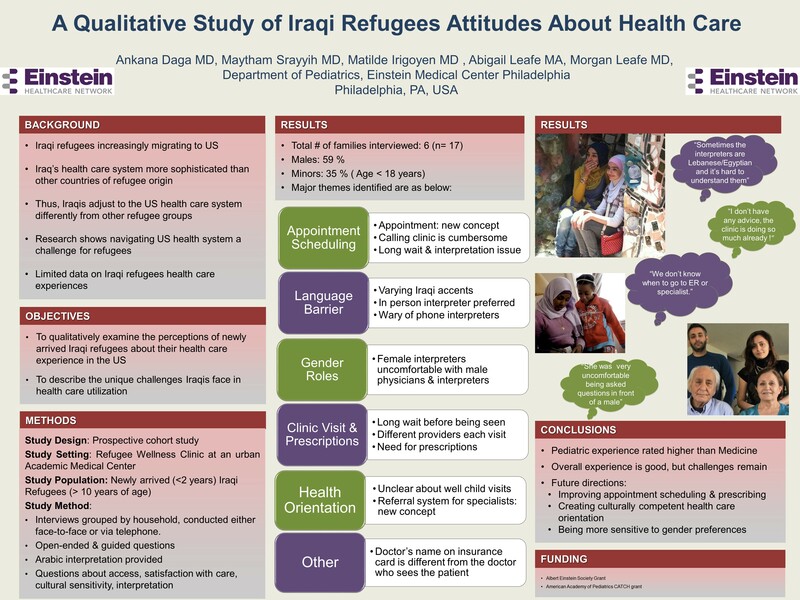 New Leafe Research recently partnered with the Department of Pediatrics at Einstein Medical Center in Philadelphia to interview Iraqi refugees in the Philadelphia region about their experiences getting access to medical care. Their stories were powerful, and the results from the research will be used to make improvements to the care that refugees receive going forward. Among our most important learnings? Language – perhaps not surprisingly – plays a tremendous role in how easy it is to access everything from care to prescriptions. And gender of the physician can sometimes make the difference between accessing care, or not. 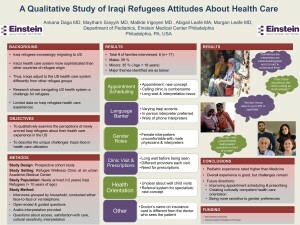 To see the poster presentation from the North American Refugee Health Conference in Toronto, click the image below.